Why is independent reading important? Becoming a fluent reader in English is one of the most important skills that will help you to prepare for college in the United States. One of the best ways for you to improve your reading is by reading texts that are level-appropriate. The more your read, the more skill you will develop as a reader in critiquing and evaluating texts, synthesizing materials from multiple sources, and note taking. Becoming a skillful reader in English will also help you to: build background knowledge, develop your English vocabulary, acquire an understanding of complex grammatical structures, and learn more about U.S. culture. This list is a good place to start looking for a good book, but you are free to pick any book from the Hostos Library or from the collection in your CLIP classroom. IF THE BOOK THAT INTERESTS YOU HAS ALREADY BEEN TAKEN: remember that books are organized by subject - so books in the same call number neighborhood may be about similar subjects. Please browse (look at the books nearby) to look for other books that may interest you and that is a good reading level. OneSearch is Hostos Library's main "search engine". All the CUNY colleges use OneSearch as a tool to find books. See here for instructions on using OneSearch to find books. Non-fiction books describe people, places, ideas, and things as they exist in the world. 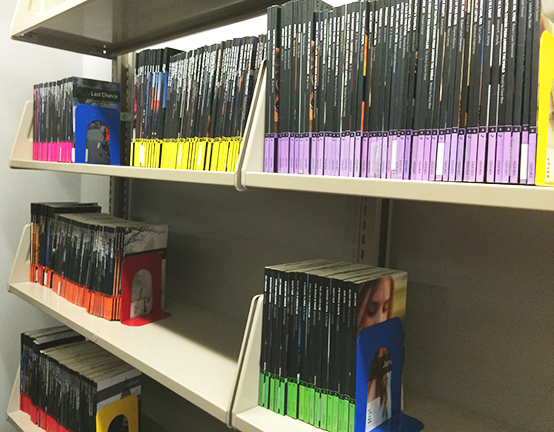 Non-fiction books in the library are ordered by subject. For example, near the Vegan Diets book are other books about food, from Caribbean recipes to the health effects of fast food. You can use the call number of a non-fiction book to go to the "neighborhood" of books about a subject that interests you. Look around on the shelf and you might find another book that is even more interesting. For a non-fiction book, you do not have to start reading on page one - instead, look at Table of Contents in the first few pages of the books. The Table of Contents is a list of all the chapters. Find the chapters that look the most interesting to you. It is best if you read the whole book, but if it is very long, you can pick part of the book for your report. You must choose at least 50 pages from the book. After the sudden death of her husband, Sheryl Sandberg felt certain that she and her children would never feel pure joy again. Her friend Adam Grant, a psychologist at Wharton, told her there are concrete steps people can take to recover from life-shattering experiences. Option B describes how many people have overcome hardships including illness, job loss, sexual assault, natural disasters, and the violence of war. This short biography shows how the events of his life shaped Malcolm X's journey from prison to becoming a leader, and the events that led to his assassination. The books shows comparisons and contrasts between him and Martin Luther King Jr., and describes Malcolm X's lasting legacy in the civil rights movement and the ongoing struggle for racial equality. In Dreams of Trespass, Fatima Mernissi weaves her own memories of growing up in Morocco with the dreams and memories of the women who surrounded her in the courtyard of her youth--women who, deprived of access to the world outside, recreated it from imagination. When he was five years old, Saroo Brierley got lost on a train in India. Unable to read or write or recall the name of his hometown or even his own last name, he survived alone for weeks on the rough streets of Calcutta before being adopted by a couple in Australia. Despite his gratitude, Brierley always wondered about his origins. Eventually, he could use technology to examine satellite images for landmarks he might recognize that might help him find home. The movie Lion was based on this book. This book examines the medieval Crusades. By the end of the eleventh century, about two-thirds of the ancient Christian world had been conquered by Muslims. Western European Christians responded by waging the Crusades, violent expeditions to stop Islamic expansion, regain control over Christian areas of the Holy Land, and seize pagan regions. Between 1987 and 1989, Alepho, Benjamin, and Benson, like tens of thousands of young boys, escaped from the massacres of Sudan's civil war. They became known as the Lost Boys. With little more than the clothes on their backs, they streamed out over Sudan in search of refuge. They walked nearly one thousand miles, sustained only by the sheer will to live. 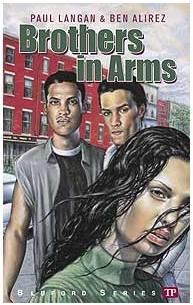 This book is the story told by the three men themselves, describing how they survived. Here is the true story of Sammy Sosa, the great baseball player from the Dominican Republic whose talent has gained him millions of fans worldwide. Many young people face daily bullying, and this is especially true for Lesbian, Gay, Bisexual, and Transgender (LGBT) kids and teens. After several LGBT teens killed themselves, author Dan Savage and his partner ,Terry Miller, posted a video talking about the bullying they suffered as kids and how they went on to happy adult lives. It Gets Better is a collection of essays from many adults writing about their own lives to show LGBT teenagers that even if they are having a difficult time now, they can have a good future. When Cris Beam moved to Los Angeles, she thought she might volunteer just a few hours at a school for gay and transgender kids. Instead, she found herself drawn deeply into the pained and powerful group of transgirls she discovered. Funny, heartbreaking, defiant, and sometimes defeated, the girls form a community. But they struggle to resolve the distance between the way they feel inside and the way the world sees them. Author Sandra Guzman continues to use her trademark warmth, humor, and wisdom to explore a wide range of topics, from dating and sexuality to family and career. The New Latina's Bible disusses important issues such as sexual abuse, domestic and dating violence, interracial love, and gender identity. In 1991, Shaka Senghor was sent to prison for second-degree murder. During his nineteen-year incarceration, Senghor discovered literature, meditation, self-examination, and the kindness of others--tools he used to confront the demons of his past, forgive the people who hurt him, and begin atoning for the wrongs he had committed. Today, he is a lecturer at universities, a leading voice on criminal justice reform, and an inspiration to thousands. Starting at any university is a major step in life. Students who speak English as a second language, studying in a new country, are taking an even bigger step. This book offers advice based on interviews with international students and their teachers. Study and Critical Thinking Skills in College encourages students to study and think in ways that match their learning styles and to use technologies (such as online databases and social media) that maximise their productivity. Latinos are already the largest minority group in the United States, and experts estimate that by 2050, one out of three Americans will identify as Latino. 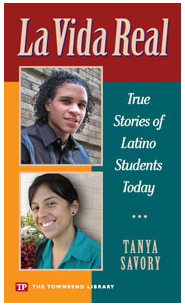 This book presents thirteen oral histories of young, first-generation college students sharing their stories and struggles. In the early twentieth century, blues music was developed by African Americans in the Deep South, with roots in spirituals, folk music, work songs, and native music. Blues moved north and influenced many other forms of music. This book examines the ways the blues has reflected the lives of African Americans over the course of history, and how the musical form continues to change today. The life story of the famous and colorful Mexican artist and her many accomplishments. This best-selling, easy-to-read guide provides advice and practical help for families whose children are growing up with two languages. Every family's situation is different, but there is a good deal that parents can do to make life with two languages easier for their children and help children benefit fully from their bilingual situation. Literature, also called fiction, includes stories, novels, poems, and plays. They might describe people, places, ideas and things as they exist in the world, but the author has imagined the details. Sometimes they describe completely invented people and places. Literature books are ordered by the country of the author and then by last name of the author. You can use the call number of a work of literature to find other books written by someone else of that country. An author's books will be all together, both in the original language and any translations. In this graphic novel, a strange disease is being passed from teenager to teenagers in Washington state, in the 1970s. The sexually transmitted disease changes people’s bodies in surprising ways. The story is very realistic in showing how young people treat each other and think about their future. The disease can be seen as a metaphor for the many strange changes that teenagers go through as they become adults. Killing and Dying includes several short stories, told in graphic novel form. They are set in the United States of today, about very different people in everyday situations. Many of the stories show both loneliness and the complicated relationships we have with the people we hope to connect with. Award-winning writer Ta-Nehisi Coates wrote the words for this story, in which hero T'Challa must confront a terrorist group. If the Black Panther’s homeland of Wakanda is to survive, it must adapt - but will its king survive the change? Aya is an award-winning graphic novel about the daily life of 19-year-old Aya, her friends Adjoua and Bintou, and their relatives and neighbours, living in Ivory Coast. Marguerite Abouet said that what she wanted to show was “an Africa without the ... war and famine, an Africa that endures despite everything because, as we say back home, life goes on." This graphic novel tells the story of the bombing of Hiroshima in World War II, from the perspective of a young boy, Gen, and his family. The story shows the physical and psychological damage that ordinary people suffer from war. Work from more than 40 writer/performers whose poetry is meant to be spoken out loud. Includes a CD so you can listen to the poems as you read them. From the Library Journal: "[this] anthology presents six plays, all written in English during the 1980s by Hispanic-American playwrights...the plays examine the themes of politics, religion, and family within the context of a common heritage. Each includes an interview with the playwright and a brief biographical sketch." From Library Journal: "Eleven contemporary plays explore the experiences of Puerto Ricans in Puerto Rico and New York. Both places play a role of their own, with the cold reality of life in New York contrasted with a sometimes lush, idealized Puerto Rico." This novel tells the story of Fabiola, a young immigrant girl. Like many people, she must learn to deal with American cousins very different from herself, a tough city, and other normal challenges. But then she is given a surprising offer and must make a difficult choice about what she will do to help her mother. Her decision changes her future. This book has won many awards for its writing. An award-winning story told in prose and poetry about twin brothers who love basketball and their family. You may know W. Kamau Bell from his hit show on CNN, United Shades of America. Or maybe you've read about him in the New York Times, which called him "the most promising new talent in political comedy in many years." The Awkward Thoughts of W. Kamau Bell is a humorous, well-informed take on the world today, tackling a wide range of issues, such as race relations; fatherhood; comedians and superheroes; his interracial marriage; and much, much more. This book by the respected Mayo Clinic gives advice on how to achieve and maintain a healthy weight. It includes recipes, advice on shopping smarter, and strategies for making a fitness plan. This book includes an introduction and chapters from people with personal experience with bipolar disorder. There is also a list of further reading and organizations that can help. 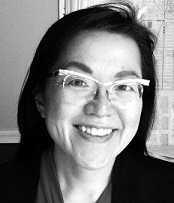 Dr. Merry Noel Miller offers women advice for coping with life's challenges and sadness, while increasing its joys. Photographs taken by 30 Bronx photographers of 80 visual artists at work in their studios or on location in the Bronx. This book talks about why people choose to go vegan, and shares the health effects of that choice. It also discusses the ethics of veganism and how companies and restaurants are changing to adapt to the vegan lifestyle. This book offers advice on page design and layout, showing how to arrange and present information with computer graphics tools. Oxford Bookworms books are very short books that have been written especially for people learning English as a second (or third, or fourth) language. There are eight levels of difficulty, from very easy to read to harder to read. Where can I find the Bookworms? 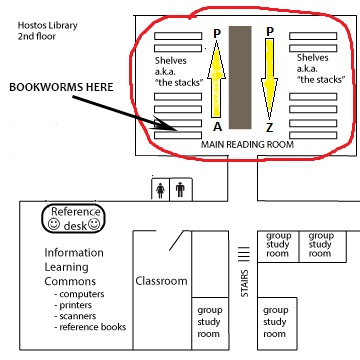 The Oxford Bookworms books are near the entrance of the library's reading room (see the map). This section also includes books published by Townsend Press. The Townsend Press books include fictional stories about everyday life as well as some non-fiction stories that people tell about their own lives. Libraries arrange books by call number. The call number is connected to the subject of the book. Because books are arranged by subject, it's a great habit to browse (look around at other books nearby), as books on similar subjects will be close to each other. 1. Looking for your book's call number, always start at the TOP of the label and work your way down line by line. You can see from the map above that "G" books will be on your left side. Look at the blue cards that show you which books are on which shelves. The "G" section will start with G, then go to GA, GB, and so on. 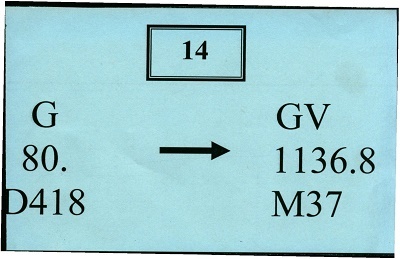 Since you've found the GV books, look at the second line of your number. Remember that call numbers are read line by line. So for example, call numbers that start with G will always come before call numbers that start with H, no matter what other numbers or letters you see below those top two lines. 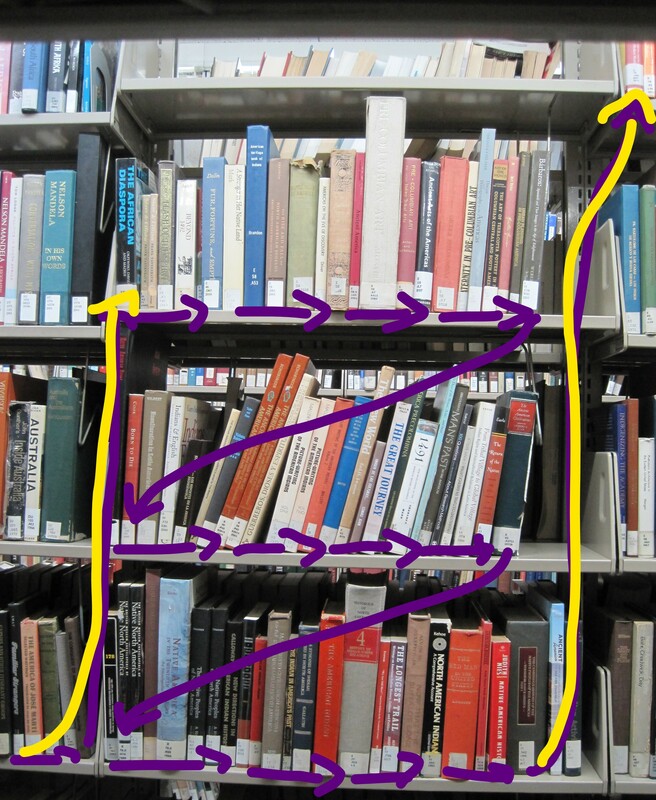 Once you have found the shelf wit h your book, notice that the shelves are divided into small sections. 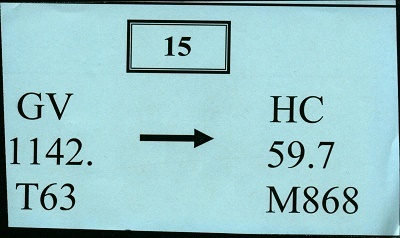 The call numbers are read in a zig-zag way within the sections: look for your call number by looking from left to right, then down to the next row. Then read across the next row, left to right, then down to the next row, until the bottom shelf. The next number will be on the top shelf of the next section. If you reach the end of the shelf and have not gotten to your number, go around to the next shelf.